Growing Flowers for a Wedding in August | Gardens Alive! Q. I'm getting married on August 24th, and would like to grow some of my own flowers for the wedding. What can I plant over the next few weeks that would bloom abundantly in late August? Specifically, I'd like plants with sturdy stems that will hold up in arrangements and bouquets. I'd also welcome any suggestions in terms of staggering plantings to make sure we have something to cut that week. At the very least, I would like to have flowers blooming at our house, as we'll have lots of people coming through. Now, I acknowledge that female wedding hysteria is a real risk. But I have a vegetable garden, grew up gardening with my parents and grandparents, my fiancé and I are avid do-it-yourselfers, we'll have help from friends and family, AND this is the only major project I plan to personally undertake. A. It sounds like Julia has already heard my standard "What? Are you crazy?" response when brides-to-be have called in to the show with similar questions, as she tries to make a case that she can handle growing her own flowers at a time when many rational, highly talented, multitasking-capable women have been known to misplace their head. I asked the highly talented professional flower grower Melanie DeVault of Pheasant Hill Farm in Vera Cruz, Pennsylvania* if she agreed…and she told me to "stop being such a cranky old man. I think it's a sweet idea," she countered. "And", she adds, "it's a lot easier to do for an August wedding than June. 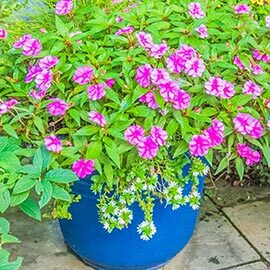 August is when a lot of easy-to-growlong-stemmed cutting flowers are hitting their peak bloom. "Zinnias" and ornamental sunflowers (the colorful, smaller ones designed for cutting, not the giant birdseed producing monsters) are the easiest," says Mel. "Just direct seed them now and they should do fine. Any idiot can grow them," she adds, looking distinctly in my direction. "And yes, I would advise succession plantings," she continues, "especially for the sunflowers. I'd sow three runs, each about two weeks apart. That way, you'll be sure to have some nice looking ones. And grow the newer, pollen-free varieties that don't shed all over the place after they're cut. "Bridal bouquets have two components," she continues, "focal flowers and filler flowers. For the focal point I like sunflowers, the daisy-like flowers of rudbeckia, and dahlias—especially the variety Karma. (That's what I used in my daughter's bridal bouquet). Some roses can also look nice. I use bits of ageratum, Baby's breath and celosia for the 'filler flowers' that make the bouquet look nice and full. There's also a tall cutting form of ageratum called "Blue Horizon" that looks really good in bouquets. "Plant the sunflowers close together (4 to 6 inches)," advises Melanie, "to get smaller blooms. Cut the zinnias when the stem is sturdy and just a little pollen is showing. And look around at what's blooming in nature around that time; Queen Anne's Lace, for instance, is really nice in arrangements. And no matter what flowers you choose, present them well. Removing every bad leaf really makes a difference in the presentation." For bedding plants in the wedding area, I'll suggest my favorite easy-to-grow annuals: begonias for somewhat shady spots and marigolds for sun. I especially like the 'firecracker' variety of marigold; it's incredibly colorful (and it's one of the first plants I grew for my wife, who is still married to me 32 years later, so it can't be that bad). Melanie adds Solenia Begonias to the bedding plant list, "especially the reds and butter yellow," she explains. "They grow nicely, even in the sun, and tend to really blossom well and look gorgeous in late summer." And the timing is going to be close, but late August is also when nurseries and garden centers begin selling pansies for fall planting. 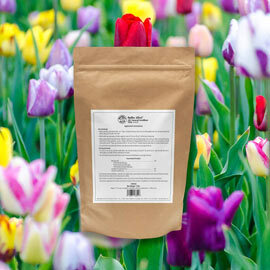 I don't advise trying to grow these cool-weather lovers yourself over summer, but see if a local nursery in your area can have a couple of flats ready for you—enough to give each guest a little four or six-pack of these very special flowers that survive the coldest winters outside in the ground. Hey—who says I'm not romantic?! *Melanie's cut flowers and her husband George's fine veggies can be found for sale just about every weekend in Pennsylvania's Lehigh Valley. On Saturday, they're at the Easton Farmer's Market.